Home › Careers - We're hiring! 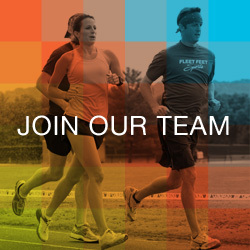 › We're Hiring FIT Associates! Do you have a sales sense? Our customers appreciate learning about our products…from shoe technology to the importance of having a nutrition plan. You should be comfortable (even passionate and excited!) about suggesting items people might enjoy. Are you good at switching gears? When customer traffic slows, you will find yourself busy with stocking, cleaning and other essential projects in the store. But when somebody walks in the door, your focus has to switch 100% the customer experience, even if you are behind in your other tasks. Can you stay calm & friendly under pressure? Imagine providing superior customer care to 2 guests at the same time (with your other team members doing the same) while 5 more guests are waiting. They all want the same level of attention and care, they want it in a timely fashion and they want you to be friendly and appreciative. Things can get very busy here and there is always other work to be done. Expect a fast pace for hours on end. Are you a team player? Fleet Feet Sports Fox Valley is like a family and we work closely with each other, sometimes under stress. And no matter what’s going on in your week, your team members will be counting on you to be here 100% when your shift begins. We all depend on and support one another. You need to be respectful and patient, and you also need to pull your own weight when it comes to customers and other work that has to get done. Are you willing to learn new things? People know us as the FIT experts. “FIT” does not just refer to shoes, but all of our products and our service. You’ll need to make an effort to get educated about all of our products, so that you can deliver the highest level of service our guests have come to expect. We’ll help you, but it will be up to you to ask questions and take the time to learn and remember things. Are you patient and eager to serve people? We expect team members to take a friendly attitude towards customers-to smile and greet them as soon as they walk in, to make conversation with all kinds of people, to serve their needs, to take time and care for them. If you feel shy or awkward about talking with strangers or if you are not willing to serve guests (even touch their feet) you may not like it here. Are you available on evenings and weekends? In this business, evenings and weekends are a KEY TIME when many of our customers shop and join us for a variety of events. It is critical to our continued success that our employees be flexible and comfortable working a variety of shifts, including evenings and weekends. If you answered “yes” to these questions, please send your resume to staff@fleetfeetfoxvalley.com. Please visit this page if you would like to read about next steps in owning your own Fleet Feet Sports location. Fleet Feet Sports is a franchise model consisting of locally-owned & operated businesses. We believe that if it is your dream to own your own Fleet Feet Sports location we want to help you make it a reality! With more than 150 stores throughout the country, we may have an opportunity for you! We are always looking for individuals who are inspired to help others, provide a premium customer experience, and are invested in striving to learn and take on new challenges. Please visit our locations page & select a location you are interested in. From there click on the "Career Opportunities" button from the store's page. We look forward to hearing from you!